Sharon Griffin, deputy commissioner of school turnaround for Tennessee, speaks during a workshop Monday, December 3, 2018 at the Hamilton County Schools Board of Education office in Chattanooga, Tennessee. Griffin visited Hamilton County in her new role for the first time Monday. 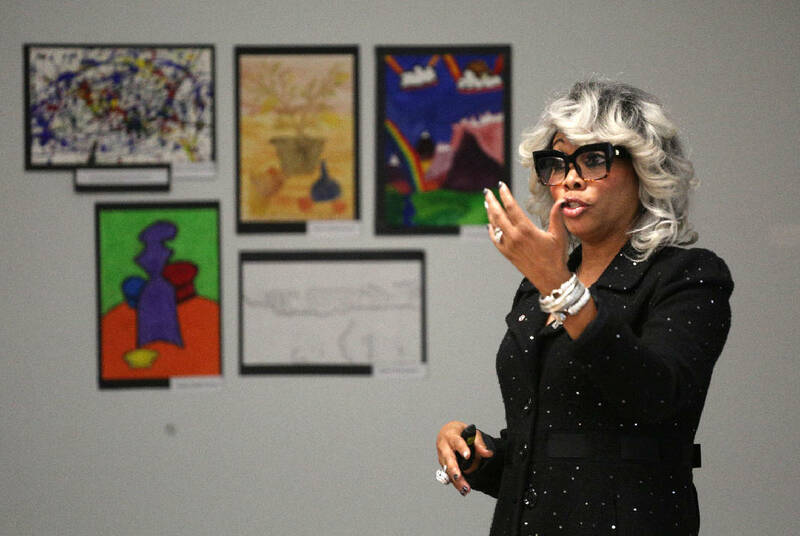 For its second meeting, the advisory board that oversees Hamilton County's five worst-performing schools through a collaboration with the state, it hosted a significant guest — Sharon Griffin, one of the pillars of school turnaround work in Tennessee. The advisory board, which includes 7 community leaders, was named earlier this year to help guide the work of the State Partnership Network, created as an alternative to a complete takeover of the district's priority schools. Griffin, previously managed the state's Innovation Zone schools before being tapped to manage the Achievement School District and join the state Department of Education as an assistant commissioner of the Office of School Turnaround. Her mission Monday night, alongside Education Commissioner Candice McQueen and Gary Henry, professor of public policy and education at Vanderbilt University, was to impart lessons learned from improving schools in Memphis and across the state to help Hamilton County develop a plan moving forward. › Valoria Armstrong, president of Tennessee American Water Co.
"What I saw today are that teacher needs, student needs are really the same," Griffin said. "What we have to do as adults is to get our system and our practices aligned so that the procedures that we want to execute are really aligned to the needs of individual schools. It's really about systems of support and making sure we are, first, transparent about where we are, and that the community really can support where grants and local funding don't absolutely meet the needs." The State Partnership Network was launched in February to support Brainerd High and four schools in its feeder pattern that have struggled for decades to improve student achievement. Overall, Hamilton County Schools established the Opportunity Zone for a total of 12 schools that benefit from school turnaround work. Griffin presented some of the strategies that helped iZone schools find success under her leadership, including the need for highly-effective talent, instructional support, extended learning days, empowered principals and student support. Strategies such as adding an extra hour to the school day and having staff reapply in order to ensure high quality teachers are in the highest-needs schools, contributed to increased student achievement, Griffin said. Alongside Griffin, Henry presented the guiding principles for school turnaround work — or helping chronically struggling schools — that he has gathered from five years of research around the country and across Tennessee. Those principles include: establishing an organizational structure for the work, addressing any barriers to improvement, improving and increasing teacher quality and retention, improving leadership capacity and maintaining stability. Henry stressed that school districts need to understand that struggling schools often need to be treated differently or be given different resources than others in the district. "Across the country, school districts are loathe to treat one school different from, another," he said. Turning around schools is going to be "an ongoing struggle." He noted that the current structure developed in Chattanooga is one of the most unique in the country. "The Partnership Network is innovative in a way that no one else is doing in the country," he said. "I really feel like that there is a recognition here that things need to be done differently to see something happen." Much of the advisory board's responsibility revolves around advocating and recommending strategies to the district through Chief of the Opportunity Zone Jill Levine, Superintendent Bryan Johnson and the state. The board also reviewed how the district has spent more than $1.7 million in federal grants and nearly a million in state priority school improvement grant funds. Three schools in Hamilton County were also awarded additional priority school state funds, it was announced Monday. Those schools are Calvin Donaldson Elementary, Orchard Knob Middle, and The Howard School. Notably, only one school board member attended the meeting briefly —Tiffanie Robinson, of District 4, who represents schools that fall into the Opportunity Zone. Through a memorandum of understanding, the Hamilton County school board still oversees local funds and how much of the funding received for the priority schools is spent, but it is unclear how much involvement the entire board has had with the Partnership Network since it was established. Monday's meeting is one of the last meetings that current Education Commissioner McQueen will attend in Hamilton County; the commissioner announced she would be retiring from her post in January.